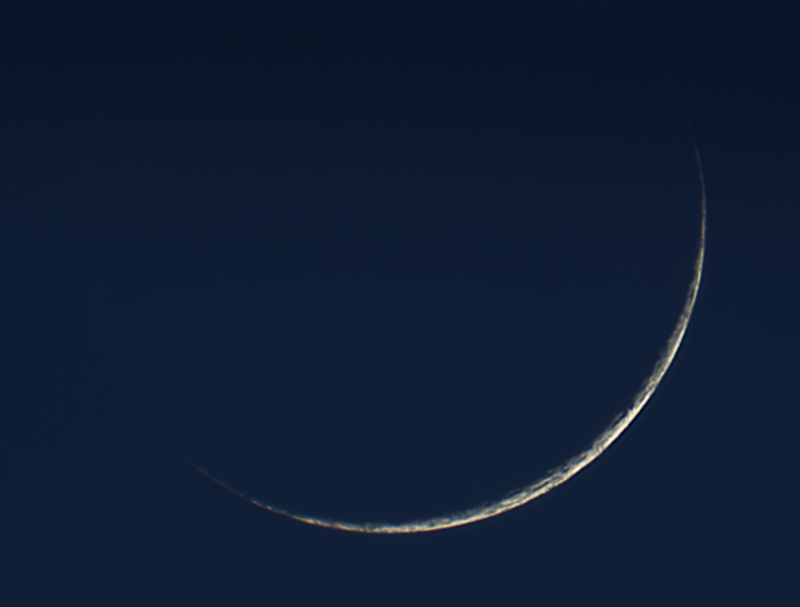 As can be seen, the crescent is getting quite thin now. Of course, by now it is actually even thinner, see for example http://www.universetoday.com/107663/astro-challenge-nabbing-venus-at-inferior-conjunction/. I’m quite happy with the way this turned out. Since these appearances were short and variable I did not manage to configure good camera settings and most frames were overexposed. In the end I deliberately used 300 frames taken through lighter clouds and therefore diminished. 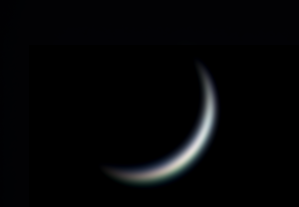 This quick image was taken with Galileoscope near sunset, with Venus about 10 degrees above the horizon and piercing through significant cloudiness. Due to bad seeing and general featurelessness of Venus it is unlikely that using the larger scope would have made much of a difference. 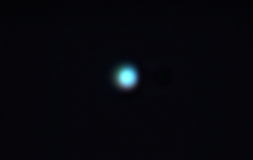 I finally managed to get a recognizable look at Venus. The gibbous phase is clearly visible as Venus progresses towards its greatest eastern elongation that will occur on November 1st (at that time it will have maximum distance from the Sun and appear “half lit”). As Venus is always hidden under 100% cloud cover, there are no surface details visible even at the best of times. As can be seen, imaging through that much atmosphere severly degrades image quality. Turbulence in the air smears the image, and dispersion (due to wavelength-dependency of refraction) turns objects into little rainbows (in fact, for bright objects the atmosphere can be used as a poor man’s spectograph). However, stacking multiple of these short exposures averages out some of the distortion, while the rainbow effect can be diminished by aligning all color channels individually. 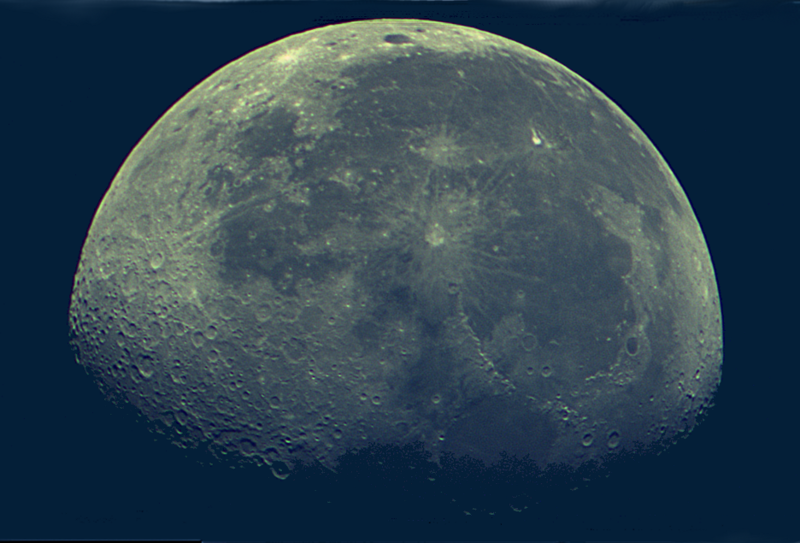 I took about 20,000 frames at 0.5 ms exposure over a period of about 4 minutes, 10,000 of which were used for the image presented here. 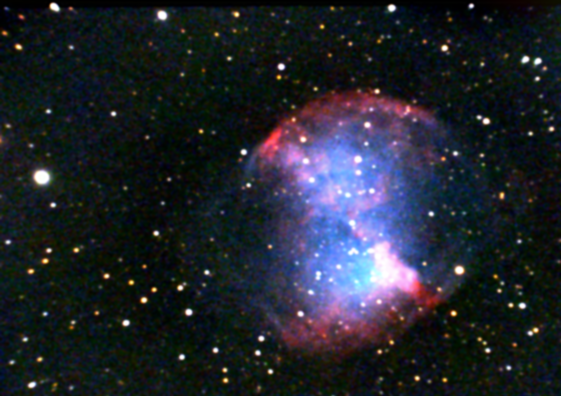 The Dumbbell Nebula (M27) in constellation Vulpecula. A planetary nebula represents the final stage in a smaller stars life cycle, such as our own Sun. Near the end of its life, the star enters a phase of Helium shell burning that causes the star to blow away its outer atmosphere with strong stellar winds, over a period of about 10,000 years. Finally, only the central white dwarf star remains, with no more exciting prospects than to spend the next billion years slowly cooling off. This is though luck for the star, but the nebula that is formed from the ejected material makes for a pretty picture from afar. 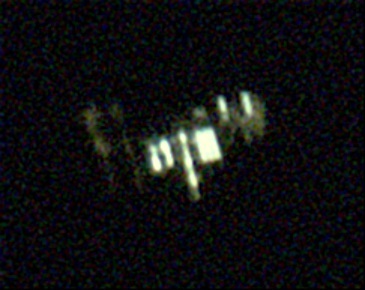 The object is still expanding at about 30 km / second. The red color is from hydrogen gas emitting in the H-alpha region. The blue and green in the center should stem from oxygen, although the lack of actual green probably indicates that I need more practice at color-balancing. Apart from that, however, it is a true color image taken in the visual spectrum. It was composed from 150 individual frames exposed for 10 seconds each, giving a total exposure time of about half an hour. A 0.5 x focal reducer was used. I am quite happy about the result because I did not have too much luck with faint nebulous objects until now, and the individual frames did not show much appreciable signal before processing. Now that I got it to work in principle I will try going for longer total exposures, that should get rid of the noisiness that is still quite apparent in this image. Todays attempt to improve on previous ISS pictures failed due to last minute cloud cover. 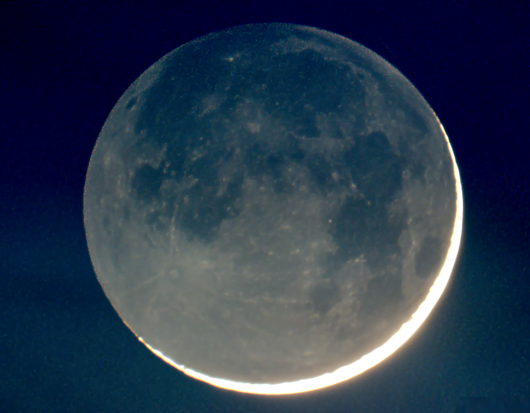 However, prior to that the waxing crescent moon presented an attractive target in the dusk. 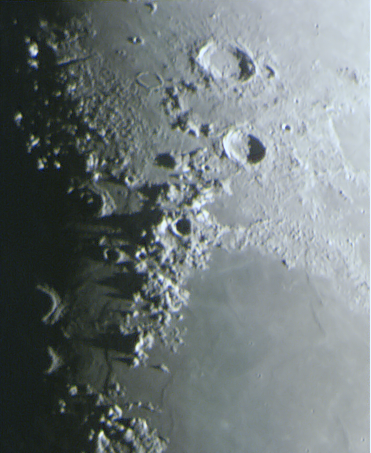 Near the terminator we see Montes Caucasus casting long shadows on Mare Imbrium. The largest crater in the image – Aristoteles – has a diameter of 87 km. Tomorrow, the ISS should make a day-time pass in front of the Moon from here. I’ll try to catch that if I get a chance. This pass at 4:05 AM over The Hague was not directly overhead, rather, with a maximum altitude of 44°, it provided a more “sideways” view of the station. Also the slower apparent velocity allowed for more relaxed manual tracking, and resulted in more individual frames of the station per pass over the chip. 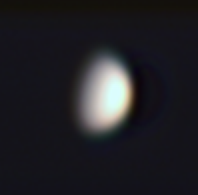 I originally went out early to image Venus in the hope of at least recognizing the phase, but didn’t get satisfactory results – I accidentally used additive binning which caused Venus to be overexposed in all frames. But I feel these ISS shots adequately compensated my disappointment. I’ll try Venus another time, although I fear I am generally not in a hopeful position for success with that lady: at latitude 52°N, Venus is already less than 10° above the western horizon at sunset, and over the sea at that. 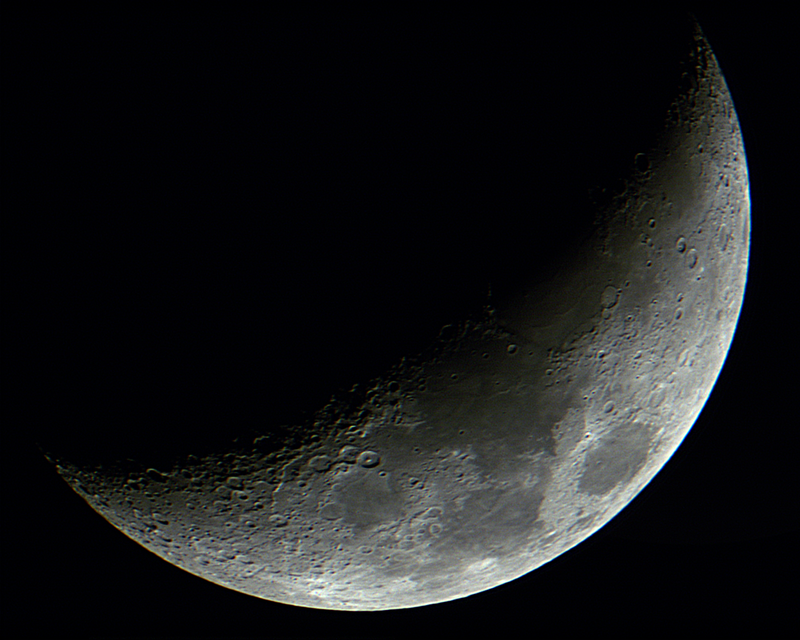 I still didn’t get an adapter to mount the Galileoscope, but improvised a bit today to take an image of the waxing crescent moon. This was taken at dusk when the sky was still fairly bright, but it still appears black due to the short exposure time. My main plan for the evening was actually to catch ATV-4 zipping across the Moon as predicted by Heavens Above, but I didn’t even see the space craft. I suspect the prediction was out of date due to all the maneuvering taking place the day before the planned docking. Well, technically it may have been the third attempt because there were two passes this night and I botched up the first (tracked diligently but forgot to take pictures …). I track manually while continually acquiring images and try to keep ahead of it in the finder, then let it drift over the chip area. One eye needs to stay glued to the finder while the ISS moves from near the horizon to almost overhead. It is probably the most sportive activity I engage in, as it requires to slowly shift from one yoga-like half-crouch position to the next for several minutes. Currently ISS is trailed in its orbit by Albert Einstein, the automated transfer vehicle ATV4. It passed about 10 minutes later and I tried to take pictures of it, but as it is much smaller it remained an unimpressive dot.